“Hundreds” of women have finally left the besieged Rukban camp in southeast Syria, local sources tell EA. The sources said the women departed the camp near Jordan, home to more than 40,000 displaced Syrians since 2015, on Sunday. On March 23, more than 360 refugees left the Rukban camp for the territory controlled by the Syrian government via the Jleb crossing point. They received necessary aid, they are provided with food and accommodation. The local sources did not confirm why the women departed, after months of an Assad regime siege and Russian efforts failed to shift the residents. The displaced fled Islamic State attacks in 2015 and were trapped in the barren area, known as “The Berm”, when Jordan closed the border in June 2016 after an ISIS suicide attack. 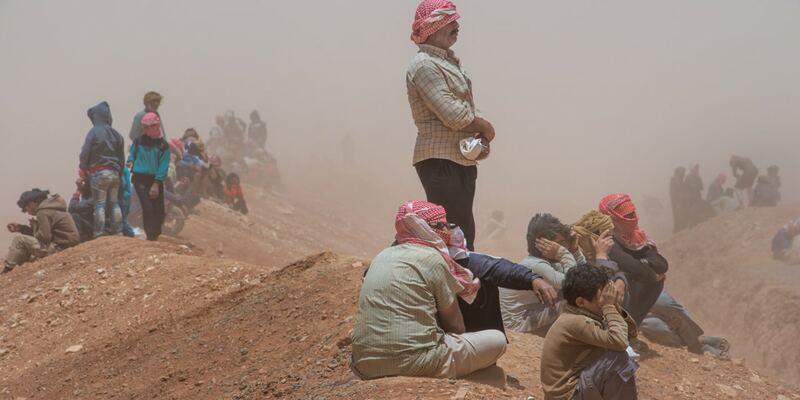 More than 90% of the residents told the UN in a survey last month that they wish to leave Rukban. However, they said they were prevented by fear of detentions and forced conscription and insecurity over the status of their property. The Assad regime cut routes to the camp last autumn, preventing Bedouin traders from reaching Rukban. Damascus has only allowed two aid deliveries since January 2018. The blockade has been compounded by Jordan’s refusal to let supplies across the border. Russian propaganda has blamed “militants” and the US military, which has a base at Tanf near the Iraq border, for its failure to force departures until Sunday. Last week, the Russian Foreign Ministry put out a tweet calling for the “liquidation” of the camp.